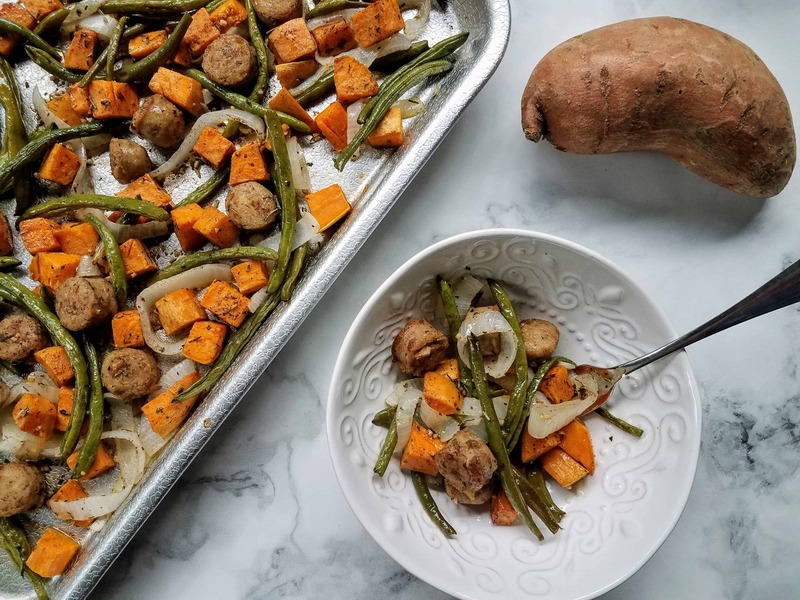 This roasted chicken sausage & vegetable sheet pan dinner is so good! The blend of cinnamon, rosemary, and parsley really bridge together the flavors of the chicken sausage and the vegetables. This dish contains a lot of vegetables as well, making it really healthy! Sheet pan dinners are my new favorite way to make dinner. I even find it easier than the slow cooker, because a baking sheet is much easier to clean than a huge ceramic insert. Plus, your food is ready much faster 🙂 I like that you can literally just throw a bunch of stuff on a baking sheet and go. It’s such an easy way to get in more vegetables, which is something I am always trying to do. 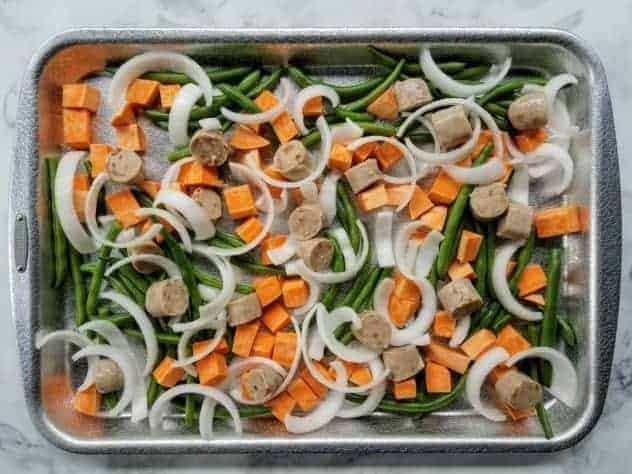 With only 10 minutes of prep work, this roasted chicken sausage & vegetable sheet pan dinner is super easy to make! Perfect for those hectic week nights where you don’t want to spend a lot of time cooking and cleaning. How healthy is chicken sausage? Chicken sausage (and also turkey) is much healthier than pork sausage when compared on a calorie and fat basis. For example, the al fresco brand chicken sausage claims that its chicken sausage contains 70% less fat than pork sausage. What is a chicken sausage? A chicken sausage is ground chicken meat with a casing on it. Chicken sausage is usually flavored with a variety of herbs and spices, and occasionally sweetened. What is a sheet pan dinner? Does chicken sausage contain pork? It can. Usually it appears in the casing of the chicken sausage rather than in the sausage itself. Before purchasing, it is important to thoroughly read through the ingredients list. 1. Preheat oven to 400F. Meanwhile, wash, dry, and peel your sweet potato. Using a sharp knife, cut it into cubes. For the onion, slice it into thick pieces so that they don’t burn and dry out during roasting. 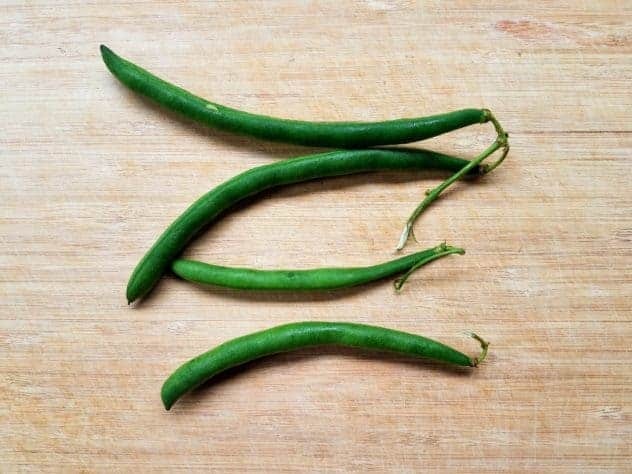 For the green beans, give them a good rinse first, and then trim off the ends. There are a few shortcuts I like to use for the green beans to speed up the trimming process. Only the end with the stem needs to be trimmed off. The sharp pointy end is edible, and does not need to be trimmed. The other thing I like to do, is to grab a bunch of green beans, align all the stems toward one end, bunch them up, and make a single cut through the pile. For the sausage, I cut them into 1″ pieces. Take the prepped vegetables and sausage, and mix them together on a baking sheet. You can also line the baking sheet with aluminum foil for easier clean-up. 2. Next, it’s time to make the oil mixture. Measure out the oil, and add the garlic, rosemary, parsley, and cinnamon. Stir until thoroughly mixed together. 3. Drizzle the oil mixture over the sausage and vegetable mixture. Toss until everything is coated. 4. Bake at 400F for 30 minutes, or until the sweet potatoes are fork tender. At the 15 minute mark, take out the baking sheet, flip the sausage and vegetables over, and place back in the oven for the remaining 15 minutes. This roasted chicken sausage & vegetable sheet pan dinner only takes 10 minutes to prep. Perfect for hectic week nights! Pair with a roll for a complete meal. Preheat oven to 400F. If desired, line baking sheet with aluminum foil. Mix the prepped vegetables and sausage together on a baking sheet. 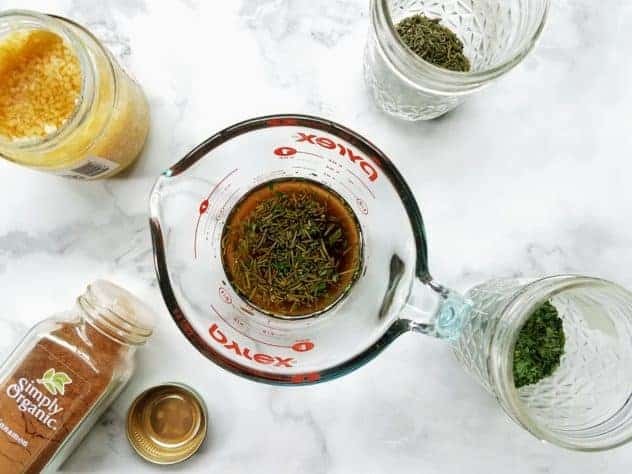 In a measuring cup, whisk together the olive oil, garlic, rosemary, parsley, and cinnamon. Drizzle the oil mixture over the sausage and vegetable mixture. Toss until everything is coated. Top with freshly ground Himalayan pink salt and black pepper to taste. 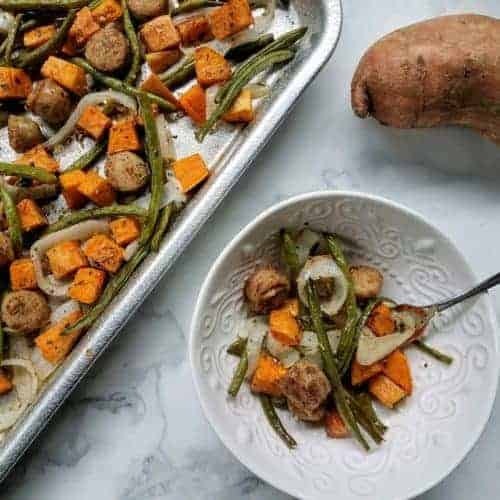 Bake at 400F for 30 minutes or until the sweet potatoes are fork tender, removing the pan at the 15 minute mark and flipping the vegetables and sausage. That looks really tasty! 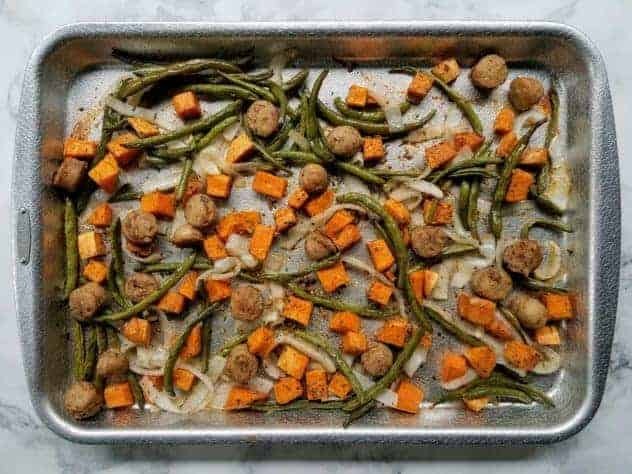 I’ve never tried making a sheet pan dinner but it sounds super easy. I LOVE this idea. I think I will try this out this week! Sheet pan dinners are the easiest and most fun way to cook dinner- they always look so pretty! Thank you for the amazing idea! 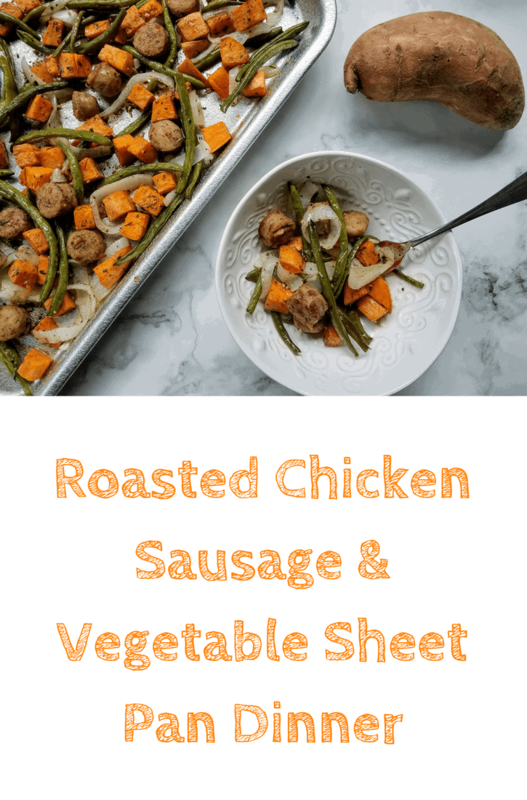 I have some sheet pan dinner recipes saved in my Pinterest board and I am adding this roasted chicken sausage and vegetable recipe too. I agree that this type of meal is quick, easy, nutritious and delicious too! This dish looks so great… yummy.. I wanna hv this for dinner as well.. can I? 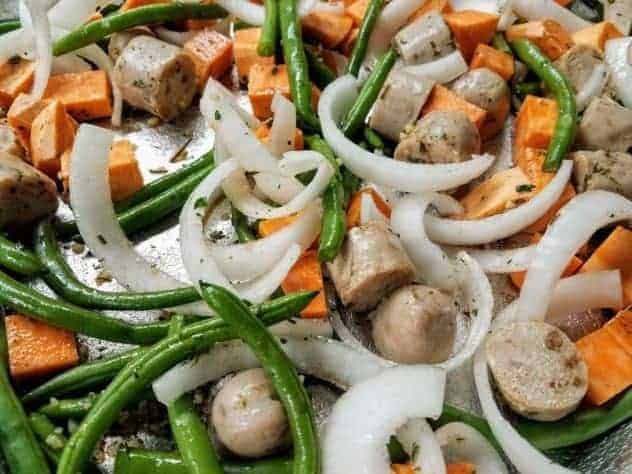 delicious leh..
I’ve never actually had chicken sausage or a sheet pan dinner but this looks tasty I’ll have to try it out! YUM! This looks super tasty and I love how easily it comes together. I am going to be making this for sure in the fall! I love how easy it is to just throw in some veggies, which I need to do more of. You had me at sheet pan dinner! Love chicken sausage as it’s a healthy alternative. Adding to my Pinterest for Fall! Learnt about a formal preparation – sheet pan dinner ! We have made numerous meals with sausages and vegetables for dinner and have always enjoyed them, What I like about this recipe is that it is very convenient being an oven preparation. Also, sweet potato as an ingredient is unique. We love to enjoy the sweet potato snacks in India, a very popular street food, prepared on charcoal. Would love to try this recipe! The addition of so many wonderful herbs is an add on for this one! This recipe looks delicious and healthy! I’ve never tried chicken sausage. It looks great!